another gaming first (this year has just been full of ’em) was beating my first sega genesis game, sonic the hedgehog which i played via the sonic mega collection on the gamecube. as you can guess this was also my first sonic game. like super mario world (which in NA came out just two months later) i’d tried out sonic 1 in the toy stores but o/w had never actually played through it. i have to say that i’d never actually even been that interested in sonic, but i got more interested due to a friend of mine in college who was a sega fanboy and obsessed w/ him, so much so that he dressed up as him for halloween. it’s gotta be a pretty rare sight to see a black guy w/ hair dyed blue and wearing red and white shoes running around, bumping into walls and dropping change. and of course my interest took a big leap when it was announced that sonic would be joining super smash bros. brawl, and so being the completist that i am i figured to begin my closer acquaintance w/ sonic i should start at the very beginning. my mostly unbiased opinion is that overall sonic 1 isn’t a great game. one of the things that i never understood about why people liked sonic so much is that people always talk about how fast the games are, but in fact there actually aren’t that many opportunities to let loose and really zoom through a stage, especially since a lot of the time if you zoom past something you end up having to backtrack anyway. and without the speeding ball of hedgehog gimmick the game pretty much becomes just another platformer. and even after playing through the game i’m still not into the “get hit once and lose all your rings” setup, which isn’t much of a step above ghosts ‘n goblins’ get hit twice and die MO. 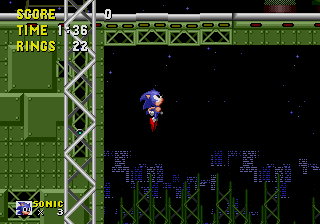 there are several “moments of brilliance” in the original, though, such as the bonus stages and some pinball-esque parts w/ sonic bouncing off of bumpers, and particularly the star light zone which does a better job than most of the rest of the game of making sonic’s speediness work w/ the level design. but in general aside from some great character design and graphics and music there wasn’t a whole lot to keep me interested. being a little disappointed i read up a bit on sonic 2, which generally seems to be regarded as the best in the series and seems to do a fair amount to remedy most of the problems i felt were in the original. i actually spent some time taking a “spin” through sonic 2, and already i can tell that i’m going to like that game a lot more. so w/ that said, hopefully the sonic fanboys won’t hate me too much until i post my assessment of sonic 2 and either see the light or give up on sonic completely.